Ernő Dohnányi was a more prolific composer than the few of his piano works to have entered the repertoire would have you believe. His career spanned the turbulent times of the early 20th century, and although he remained a traditionalist, or at least a tonalist, he did seem to keep up with fashions and tastes as they rapidly changed. The two quartets on this disc date from before and after the First World War, which may explain the aesthetic distance between them. Dohnányi rarely strays far from the Hungarian folk idioms that inspired him, but the way that this melodic material is elaborated in the two works couldn't be more different. The First Quartet is, for the most part, well mannered, homophonic music, with just enough textural variety to avoid monotony over its half hour span. The third, by contrast, is much more contrapuntal, and more harmonically adventurous too. Or perhaps the composer's age is the reason for the relative simplicity of the earlier work. 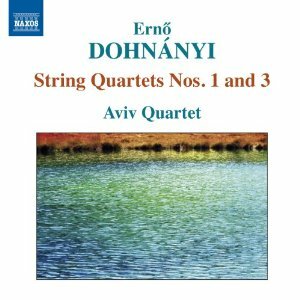 The First Quartet was written when Dohnányi was in his early 20s, and from that point of view it is a work of tantalising promise rather than extensive or fulfilled ambition. Nevertheless, it is the First Quartet that comes off best in this recording. The young Israeli Aviv Quartet, not to be confused with the more established Tel-Aviv Quartet, really excel in the clear, consonant textures of the earlier work. The recording balance also favours these more straightforward textures, especially the clear, penetrating bass of the cello, adding definition to the ensemble in every phrase. The Third Quartet is more complex and requires more interpretation. The Aviv players make an uncertain start with some exaggerated portamento slides off anacruses in the opening bars (are they in the score?) but then settle into the main argument of the music. Some of the denser harmonies could do with more accuracy in the intonation, but the composer isn't doing the performers any favours in the way that these chords are voiced. My initial concern on hearing this Third Quartet was that the music has more dramatic potential than this performance provides. However, listening to the main competitor on the market, from the Lyric Quartet (ASV CDDCA985), it is clear that their reading is similarly low on dramatic power. So I'm inclined to blame the composer for that one, for using a harmonic language and a range of musical structures that suggest dramatic intensity but for the most part fail to deliver it. Or perhaps the problem is that comparisons, even subliminal ones, between these and Bartók’s string quartets are inevitable. Dohnányi may have acted as a link between Brahms and Bartók, but if so, his example only goes to show how many of Bartók’s innovations were his own work. But comparison with Brahms does show Dohnányi branching out into some 20th century ideas about harmony, structure, and the possible relationships between folk elements and classical forms. And Naxos are to be congratulated, as ever, for digging out some interesting and neglected repertoire. It may not have the historical significance to justify a commercial recording, but it is certainly worth hearing on its own terms, and the Aviv Quartet, while their performance is a little too understated and occasionally imprecise to be definitive, are certainly competent enough to fulfil the demands made on them by the composer and the label alike. It seems disingenuous to call Jonathan Harvey one of Britain’s greatest composers, given his apparently greater affinity with recent developments in French music. 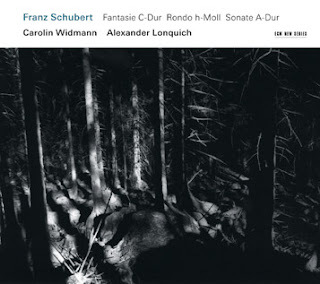 Messiaen and his Spectralist successors between them make up the cultural context for this disc. Yet the way those influences are combined is distinctively Harvey. 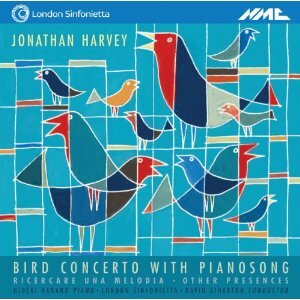 Bird Concerto with Pianosong, while it isn't described as such, is clearly a homage to Messiaen. The work uses recorded birdsong, which is combined with the piano and orchestra. As in Speakings, Mortuos Plango, and many other of Harvey's works, the idea here is to gradually bridge the timbral and conceptual space between the two kinds of sound. Like Messiaen, Harvey must slow down and lower the pitch of much of the birdsong to bring it into the range of the instruments. The percussion section acts as a bridge between the two sound worlds, and friction drums are used effectively to ground the otherwise flighty textures. The solo piano part often resembles Messiaen's birdsong works, but the textures are lighter. In fact the textures throughout the piece, in the electronics, the orchestra and the piano are considerably more approachable than in Messiaen. Harvey occasionally opts for percussive or jagged textures, but they usually relent sooner rather than later. Otherwise, the meditative moods that the work often lapses into owe much to the Spectralists, particularly Grisey, and also presumably to the composer's Buddhist faith as well. The other two works on the disc (Ricercare is presented twice in versions for oboe and cello), both work on the more straightforward premise of a solo instrument with live electronic manipulation. One remarkable feature of Harvey's use of electronics is his ability never to be defined by the state of the technology. Ricercare dates from 1984, while Other Presences was written in 2006. But both sound fresh and new. There is no sense here of experimentation, rather Harvey shows complete mastery of his means. Both works involve real time manipulation of the solo instrument's sounds. The idea is to invoke other, virtual instruments with related but clearly different sounds. So the range of the instrument is extended through the electronics, most effectively in the oboe version of Ricercare, where a deep bass oboe or bassoon sound comes through as an accompanying voice. Harvey's Buddhist faith is again invoked in Other Presences, when the trumpet sound is manipulated and lowered to resemble the dungchen, the long straight trumpet of Tibetan ritual. The performances, sound manipulation and recording are all to the highest standard. One disadvantage of an audio recording is that you can't see where or what each sound is coming out of. In fairness, that is often the case with live performances of Harvey's music as well, and as the composer is clearly intent on blurring the boundaries, perhaps it isn't relevant. Pianist Hideki Nagano is the ideal soloist for the concerto. His touch is precise, yet he always gives the impression that he is exploring the textures and contrasts as much as the composer. The players in the solo works are equally competent, but should share equal honours with the Sound Intermedia team, who do an excellent job of realising Harvey's terrifyingly ambitious electo-acoustic ambitions. This is probably the most symphonic Meistersinger you'll ever hear. 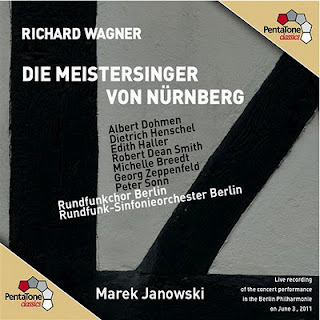 Conductor Marek Janowski's stated aim with this cycle of concert recordings is to liberate Wagner's operas from the excesses and distractions imposed by stage directors. The result is Wagner as pure music, with the story played out through harmonic progressions and leitmotifs rather than with staging and acting. The score certainly provides all the musical logic that such an approach requires, I'm just not sure it give us the whole picture. Wagner struggled to reduce the primacy of the music in his Gesamtkunstwerk concept, and the fact that this project succeeds as it does only goes to show how Wagner himself failed to integrate and balance all the elements of his new genre. Musically speaking, the singing here is excellent, and you'd be hard pressed to find a cast of such high and even quality on any other recent recordings. Albert Dohmen has a light tone for Sachs, but has all the authority the role requires. Georg Zeppenfeld and Dietrich Henschel are both surprisingly bassy as Pogner and Beckmesser. Robert Dean Smith has an impressively even tone across the wide range that the part of Walter requires. He sometimes sounds a little distant, but that might just be a result of his slightly nasal tone. Peter Sonn brings a rich but focussed tone to the part of David. And Edith Haller has confidence and presence as Eva, although her vibrato, even on the shortest notes, may not be to everybody's taste. But the qualities these singers bring to their various roles are strictly musical. Given Janowski's allergy to stage directors, he presumably vetoed any 'semi-staged' element to these performances. As a result, there is very little sense of characterisation in any of the sung roles. Dialogues are musically precise, but the interacting is always with the listener rather than between the characters. The stereo mix distances the singers from each other, which only increases the sense of alienation between them. Little effort is made to make Pogner sound old, or to make David sound young. And the huge symphony chorus, impressive as it is in the riot scene, sounds far too big ever to fit on a stage. But so much for what this recording isn't. As I say, Janowski has other aims, and when judged by those standards everything here is a triumphant success. His interpretation manages that tricky balance between freedom of expression and adherence to Germanic musical values. There is also plenty of humour, something that many conductors bypass in an effort to make the work sound more Teutonic. The absence of staging, or even semi-staging, allows the conductor to take every tempo more or less as he likes. So, for example, the transition into the 2nd scene of Act 3 is an orchestral show-piece, and the riot at the end of Act 2, is paced to show off the chorus at their best, without having to worry about their acting responsibilities. In fact, the whole of the second act is a real treat, with the orchestra continuously swooning through all the various love songs. Janowski's symphonic vision for the piece pays off in the dramatic climaxes in the outer movements. He really lets the brass go to town, and raises the dynamics of the rest of the orchestra to match them. That makes for some impressively conclusive conclusions, and some startling punch chords when they appear out of the blue. And in case that makes him seem heavy-handed, there is plenty of delicacy here too. Listening to the Overture, it is clear that he is keeping a great deal in reserve for later on, making this opening more of a tantalising taster than than the robust concert opener we are more used to. The sound quality is up to PentaTone's usual high standards, giving exceptional clarity to soloists, orchestra and chorus alike. But again, it is worth bearing in mind that this has the effect of emphasising the concert hall setting. The acoustic at the Philharmonie is expansive and generous, making the recorded sound warm and inviting, but also distancing it further from the ambiance of an opera house. Just one technical problem to report: I've had a lot of trouble getting my player, a Marantz SA8003 to recognise the stereo SACD layer on all four discs. I've never had any such problems with any other SACDs, not even the Flying Dutchman in the same series. Asking around on message boards, nobody else seems to have found this, and when I contacted PentaTone they were at a loss to explain it as well. As a result, I have had more occasion than usual to compare the CD and stereo SACD versions. For the most part, the CD layer is very good, and almost as good as the SACD layer, when I've been able to access it. The difference comes in the complex contrapuntal textures, especially from the choir. The riot scene in Act 2 is impressive on CD, but on SACD all the individual lines are apparent, adding a whole new dimension to the music. If anybody else has been having these problems, I'd be interested to hear. In the mean time I'll continue struggling to get the SACD to play, as it is certainly worth the effort. It takes a bit of thinking to work out the connection between the works on this disc. But the answer is: Ukraine. Onyx don't give artist bios in their liner notes, so it helps if you already know that Karabits is Ukrainian. The 'Little Russia' of Tchaikovsky's symphony is of course Ukraine. The Bare Mountain on which Mussorgsky spends a night is, it turns out, a real place in Ukraine. And Pictures at an Exhibition – well, its the finale obviously. Another startling connection between Tchaikovsky 2 and Pictures is the opening of their respective finales, which for about eight bars sound almost identical. That comes as quite a surprise when you think about how different Tchaikovsky and Mussorgsky were as artist, and the ground between them certainly opens up as the two movements progress. Even so, they were written within just a few years of each other, so some kind of cross influence can at least be suggested. Even though the second is among the least recorded of Tchaikovsky's symphonies, there is still stiff competition from a wide variety of contenders. Coincidentally (I think), one of the most impressive recordings on the market is the Bournemouth Symphony Orchestra's previous recording, under Andrew Litton from the early 1990s. Then, as now, the piece really worked to the orchestra's strengths. They have had a succession of Russian or Russia-obsessed conductors over the years who have nurtured a real sense of Slavic spirit, especially in their readings of Tchaikovsky’s more folky works. Karabits takes a slightly more laid back approach to Litton, going more for atmosphere than drive. This works very well in the first two movements, although the Scherzo is a bit flaccid. Tempos in this third movement are on the slow side, and there is little in the way of drive from the accents or dynamics. But otherwise this is a fine reading of the symphony. There are one or two problems of tuning and ensemble here and there, but the soloists redeem all, especially the lead horn and bassoon in the first movement. The original version of A Night on Bare Mountain has only recently come to wide attention, and the idea of finding it on a populist programme like this even ten years ago would have been unthinkable. One reason for that is that it is quite difficult to pull off. It is more congested than Rimsky's revision, with lots of overlaps between the sections. But Karabits is able to make it work. The orchestra is on excellent form here, and all those vital details come through. Able to rely on his forces, he takes the piece at a driving pace, exaggerates contrasts, and generally just gives it everything. The three works on the disc are all played well, but this is the standout performance. It is one of the few recordings of the original version that don't make you wish you were hearing the revision. Pictures at an Exhibition gets a similarly dramatic reading. Again, Karabits really stresses the contrasts of dynamics. His tempos are moderate, but never dull. There is a lot of very legato playing, which sometimes threatens the momentum. In the opening Promenade for example, the trumpet solo really leans on the slurs, and when the full string section enters, it is like a wall of sound, with little apparent articulation or phrasing. But again, the orchestra's fine soloists (none of them named sadly) elevate a worthy performance into a satisfying and worthwhile one. All round an enjoyable recording, with some fine playing and some interesting interpretive ideas. Whatever the Ukrainian links, the coupling still feels random though. 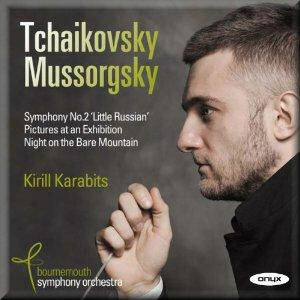 And much as I love both Mussorgsky works, I'd far rather have heard Karabits' take on Tchaikovsky's First Symphony. Hopefully they're saving that one for next time. Prague has one of the most vibrant chamber music scenes in Europe, and Czech record labels do a great job of representing the city's many fine ensembles on disc. Sadly, the foreign distribution of these CDs is poor, and the number of them that make it onto the international market is no reflection of the sheer quantity and range that you can find there if you visit. One or two companies are making efforts to put this to rights. Czech Music Direct (http://cmd.czecheverything.co.uk/) import discs into the UK from a variety of Czech labels, and there are many gems to be found in their catalogue. The distribution arm of Harmonia Mundi are also to be congratulated for bringing us this series from the Praga Digitals label. If this disc is anything to go by, the standards of performance and recording that the label offers are well up to highest you could find in any country. 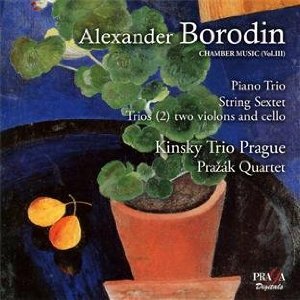 Borodin's chamber music is presented here by two Czech ensembles, one young, the Kinsky Trio Prague founded in 1998, and one old, the Prazak Quartet, who have existed in one from or another since 1972. The standards of the two ensembles are equally high. Just as importantly, they both have a similar sound, so switching back and forth between them, as this programme does several times, never disrupts the flow of the music. And the music does flow from one work to another with extraordinary ease. With the exception of the final Serenata alla Spagnola all the works here are early, dating from 1850, when Borodin was 17, to 1862, when he formally joined the 'Mighty Handful' of Russian nationalist composers. The nationalism of Borodin's later music is not so apparent here, and the only work with an explicitly Russian source is the G minor String Trio, which takes as its theme the folksong How did I grieve thee. Elsewhere the music is surprisingly German in character. Comparisons with Brahms' mature chamber works may be anachronistic, but they point to a shared source of influence in the music of Robert Schumann. And when the music does start to lean towards a more muscular, Russian sensibility, the style tends towards the cosmopolitanism of the (admittedly again later) chamber music of Sergei Taneyev. These works are all competently composed, and in general the only clue that the composer is young is that he has not yet found the distinctive mature voice for which he is now famous. One consequence of this is that the melodies aren't quite as catchy as those in his later string quartets. That said, this is all melodically driven music, and that knack for melody that served Borodin so well in his later years is clearly developing apace through these pieces. The Piano Trio in D major that opens the programme is an impressive and substantial work. It is incomplete, in that it is missing a finale, but the three existing movements add up to 22 minutes. The Kinsky players do a good job of keeping the textures light and rhythms bouncy in the first movement. They are a bit more ponderous in the Intermezzo third movement, as if they are trying to present it as a substitute for the missing finale. But that weight is good preparation for the String Sextet to follow. Again, any comparisons with Brahms must be considered coincidental, and rich as the textures are that Borodin draws from this bass-heavy grouping, they are still lighter than anything in the Brahms Sextets. This too is an unfinished work, with only two tantalising movements. Then come the two String Trios, which sound remarkably similar in texture to the Sextet, as if Borodin is underplaying his hand with the larger ensemble but then making the very most of what the three players have to offer from the smaller grouping. The combination is curious, and rather than use viola for the middle part, Borodin opts for a second violin. But he achieves remarkable richness nonetheless. The SACD sound is an added bonus, and not something we yet associate with Eastern European labels. The sound is precise and immediate, without ever being too analytical. The piano has a roundness to its tone in the first work, not ambient as such, but certainly warm. I understand that there has been some confusion about the SACD credentials of the previous volumes in this series, and while I can't comment on the surround mix, the SACD stereo layer certainly is what it says it is. An interesting recording then, from two ensembles and a label that we could do with hearing much more from. Here's hoping that the distribution deal with Harmonia Mundi finds it the appreciative audience it deserves.